The principle and application of the proposed integrated system is presented in Figure 3. Figure 3. 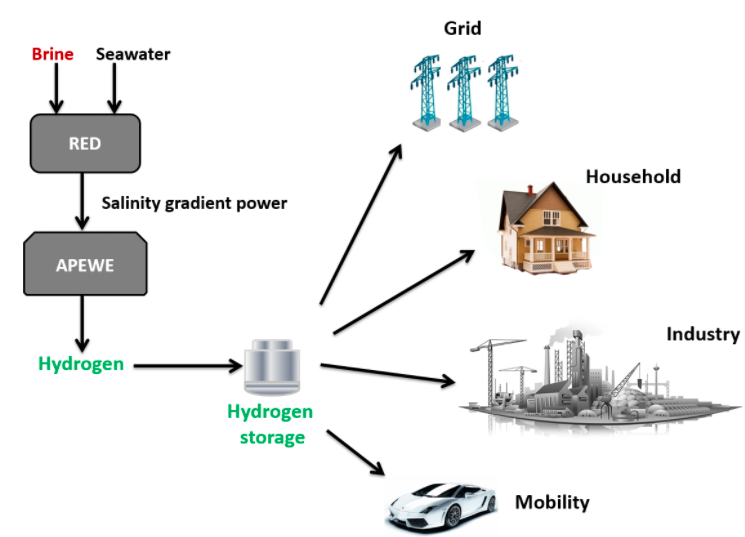 Illustration of salinity gradient powered hydrogen production and potential applications. A typical scheme of RED unit is illustrated in Figure 1. Anion exchange membranes (AEM) and cation exchange membranes (CEM) are alternatively stacked between spacers to create adjacent low concentration (e.g. seawater water) and high concentration (e.g. brine solution) compartments (there after indicated as LCC and HCC, respectively). The chemical potential difference causes the transport of ions through ion exchange membranes from HCC to LCC solutions. Specifically, for NaCl solution, Na+ ions tend to diffuse through CEMs towards the cathode, while Cl- ions diffuse through AEMs in the opposite direction towards the anode; overall, a positive potential is generated on the left side of the stack. Transport of ions through the membranes occurs if an electrical load is connected to the electrodes placed at both sides of the membrane pile: the ionic current in the cells is converted into electron current at the electrodes by redox reactions. The electrical current and the potential difference over the electrodes can be used to generate electrical power. Figure 1. The principle of energy production by SGP-RED stack. 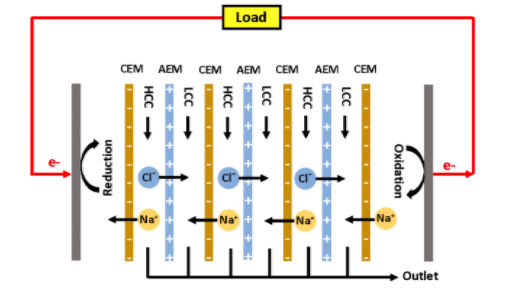 A voltage is continuously generated so long as the Low Concentration Compartment (LCC) and the High Concentration Compartment (HCC) are fed with NaCl solutions at different salinity. A scheme of a typical APEWE unit for hydrogen production consisting of a single cell equipped with a anion selective membrane (ASM) is reported in Figure 2. When a direct current is applied to the electrodes, electrons flow from the anode to the cathode where hydrogen ions (protons) are reduced to gaseous hydrogen. Driven by the electrical field between the two electrodes, hydroxide ions are transferred through the AEM to the anode, and are oxidized to O2 returning electrons to the positive terminal. Figure 2. Schematic illustration of alkaline electrolysis unit equipped with a solid polymer electrolyte (Anion Selective Membrane): 1) gas diffusion layer; 2) catalyst layer. The MARVEL project allows the candidate to broaden his knowledge and expertise in design and development of material and processes for electrochemical energy systems through advanced research and training activities. Key competencies achieved after completion of the MARVEL is envisaged to have a huge impact on the career prospects of the candidate, to hold a position in leading European Universities or industry, to perform a cutting-edge research and innovation through a multidisciplinary investigation approaches on renewable energy generation and hydrogen technologies. 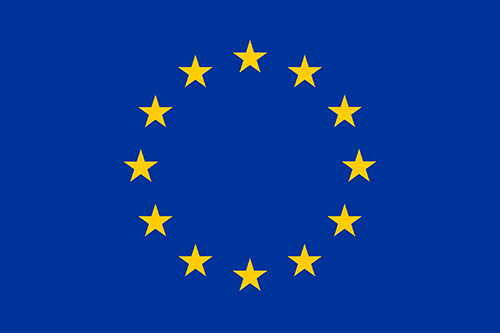 The success of MARVEL in terms of commercialization of RED has a significant contribution to the achievement of the EU 20-20-20 targets with the aim to raise the share of EU energy consumption produced from renewable sources, reduction of greenhouse gas emissions and an increase of EU’s energy efficiency, all by 20%. The new generation materials developed for the highly innovative RED and APEWE systems will allow surpassing the achievements at the current state-of-the-art, thereby increasing the research and industrial competence of EU in the world. The significant improvement in efficiency of integrated RED-APEWE under MARVEL project represents a key milestone in the era of the ongoing research striving to develop alternative routes for sustainable hydrogen production. The extra 38 Mt/yr of hydrogen estimated to be produced from the globally available SGP will significantly contribute to the hydrogen economy, and to the challenges of ensuring secure, environmentally sustainable and economically competitive EU energy supply for generations to come. The MARVEL will use high-quality strategies to maintain effective transfer of research-based knowledge to the interested parties thereby maximizing the impact of the research, to raise policy-makers awareness, to attract new partners and scientists, to enhance reputation and to exploit results with the industry.